Are You Flushing Money Away? With the focus today on gaining efficiencies in the home — energy efficiency, solar efficiency and water efficiency — choosing a low-flow toilet is a key way to save on water bills. And, if you have an older toilet that uses more than 1.28 gallons per flush (Gpf) you may want to schedule a bathroom renovation and invest in a new toilet. Miller cites the Summit 1.28 Gpf toilet that features MagnaFlushTM flushing technology as a prime example of performance married with low water usage. This toilet can flush 1,000 grams MaP (a testing combination of waste and toilet paper) with just over a gallon of water. The high efficiency toilet (HET) meets the WaterSense® rating criteria set forth by the Environmental Protection Agency (EPA). Another way to save water in the home is by selecting a dual flush toilet. Two push buttons at the top of the tank give the user the option to use less water to remove liquid waste and more water to remove mass from the toilet bowl. The Summit Dual Flush uses just 1.1 Gpf for liquid waste versus 1.6 Gpf for mass removal. 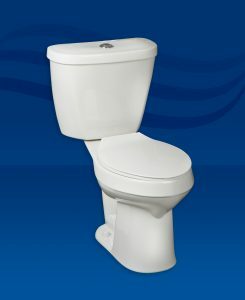 Also earning the WaterSense rating, this toilet combination is ideal for homes with larger families. Want to go even lower in your overall water usage? QuantumOneTM toilets use just 1.0 Gpf with every flush. The high efficiency toilet tank provides pressure-assist flushing action with superior performance over conventional gravity flush toilets. “According to the EPA, toilets are the main source of water consumption in the home, with almost 30 percent of indoor water usage related to toilets,”* says Miller. “When you consider that the average person has at least five flushes per day, this can add up to substantial water bills for a family.